In the European Prospective Investigation into Cancer and Nutrition (EPIC), 416,746 individuals from 10 countries completed demographic and dietary questionnaires at recruitment. Cox proportional hazards models were used to estimate hazard ratios (HRs) and 95% confidence intervals (CIs) for incident lung cancer (n = 3731) risk relative to haem iron, non-haem iron, and total dietary iron intake. A corresponding analysis was conducted among a nested subset of 800 lung cancer cases and 1489 matched controls for whom serum cotinine was available. 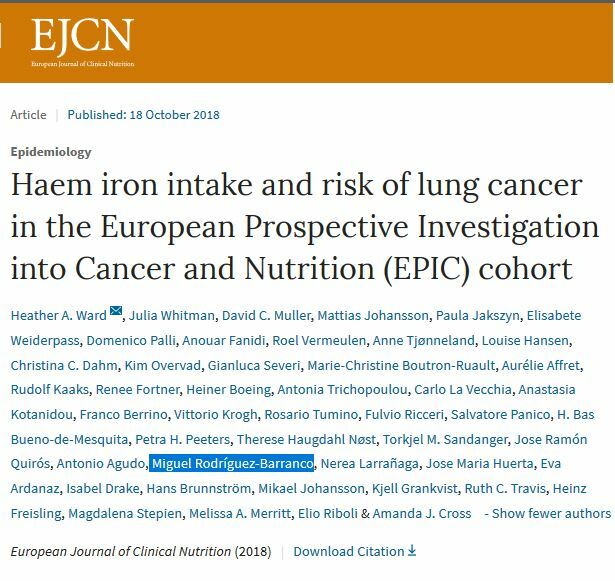 Haem iron was associated with lung cancer risk, including after adjustment for details of smoking history (time since quitting, number of cigarettes per day): as a continuous variable (HR per 0.3 mg/1000 kcal 1.03, 95% CI 1.00–1.07), and in the highest versus lowest quintile (HR 1.16, 95% CI 1.02–1.32; trend across quintiles: P = 0.035). In contrast, non-haem iron intake was related inversely with lung cancer risk; however, this association attenuated after adjustment for smoking history. Additional adjustment for serum cotinine did not considerably alter the associations detected in the nested case–control subset. Greater haem iron intake may be modestly associated with lung cancer risk.